Continental's solution replaces conventional loudspeakers with actuators that create sound by vibrating certain surfaces in the vehicle. The A-pillar is suited for high frequencies, the door panels for medium frequencies and the roof lining for low frequencies, Conti said. Continental's speaker-less in-car audio solution reduces weight by up to 90 percent compared with today's sound systems. However, even the head of advanced development at the supplier's interiors division says he was “extremely skeptical” about going speaker-less. “I didn't even want to hear it,” said Karsten Michels, who was reluctant because the quality of the sound produced by the other speaker-less audio systems he heard was so bad. Michels had a lot of experience with this topic, which was something he worked on during many years at Volkswagen Group. His impression changed when he listened to Continental's new system. “I didn't believe it a first,” he said. Continental made Michels a believer by replacing conventional loudspeakers with actuators that create sound by vibrating certain surfaces in the vehicle. That means Continental is treating the car itself as an instrument. The experts I spoke with said the A-pillar is suited for high frequencies, the door panels for medium frequencies and the roof lining or rear shelf for low frequencies. Today, Michels wonders whether audio heavyweights such as Bang & Olufsen and Harman ought to be worried. Why? Because it is estimated that the speakers in today's cars add up to 20 kilograms of weight. Continental says its solution cuts that to as little as 2 kilograms, a 90 percent improvement. Another benefit is that designers gain a lot of “box volume,” that means they will have more space in the car to use for storage or to provide other benefits to occupants. In addition, Continental says its system uses a fraction of the power that current systems require. If we're moving to electrified, autonomous cars then adding space while subtracting weight will be crucial, potentially putting loudspeakers on the endangered species list. 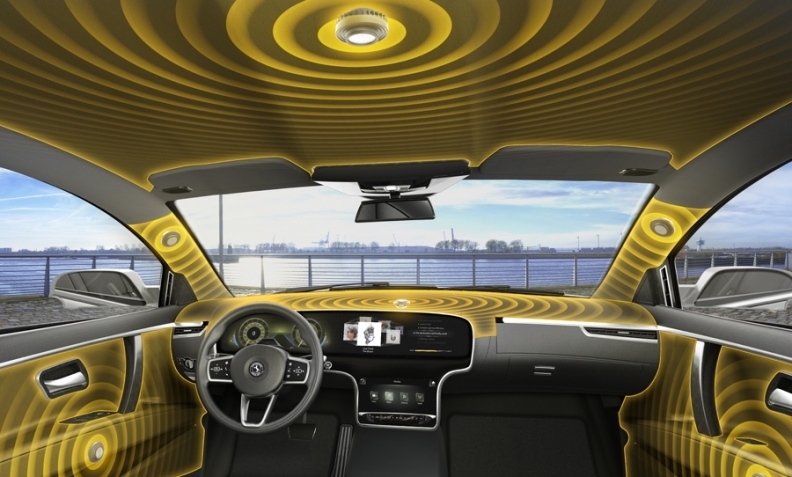 Continental feels confident in its ability to succeed in this new sector because of its expertise in vehicle noise, vibration and harshness (NVH), acoustics and manufacturing. The German supplier asked experts to rate the acoustics of its solution and says it received top scores from master luthier and physicist Martin Schleske of Germany. My credentials are not nearly as good, but after hearing the system I can confirm the sound quality is very good. Time will tell whether loudspeakers will start disappearing from future-generation cars.